In the previous tutorial, we had a brief introduction to slim3 and we set up our application to use Laravel’s Eloquent to communicate with our database. We also created our database schema and setup Phinx to help with our migration files. Finally, we included a validation package that ensures our users submit the right data to our API. In this tutorial, we will proceed to build our controller and models. 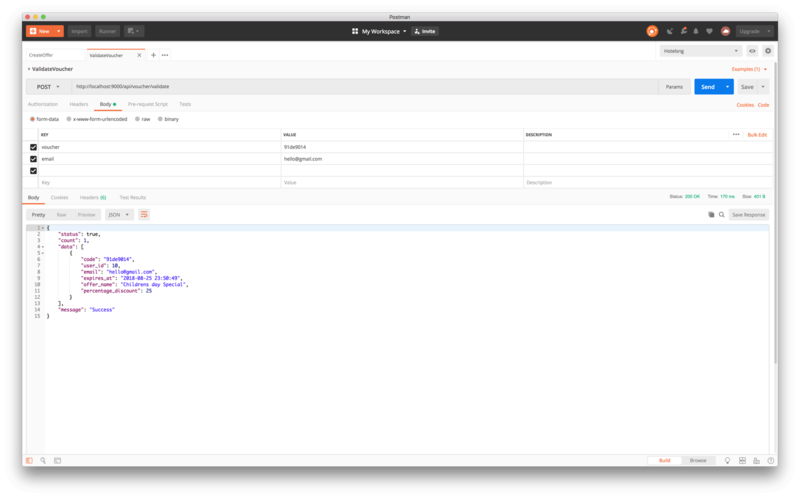 We will also create endpoints and test the output data using Postman. In the above code, we used the Respect validator and filtered through all emails being sent to our API. If the email field is empty, we want to validation error to the user. Awesome! Now that we have our controller and models set up properly, we need to tackle our first task. Now that we have created our offer, we need to create voucher codes for all recipients. Remember, our recipient information is part of the input fields to be submitted to the /offers/create endpoint. Before vouchers can be issued to our users, we need to create the users. You will notice a method in our create method from our VoucherController that redirects to the findMultipleEmail() method on our user model. We are using a firstOrCreate() Eloquent method because we might receive a request to create vouchers for users that already exist in our database and that of users that do not exist. With firstOrCreate(['email' =>$email_list]), it checks if the user exists. If they do, it returns the user's details, if it does not, it creates a new user. The last piece to this puzzle is, creating the vouchers and assigning them to the users created. From our create method in the VoucherController, you will notice we have a create() method that links to our voucher model and it accepts two arguments, the offer_id and users_id. With this, we are done creating our first endpoint 💃🏼. To solve this, we will create a new method in our VoucherController called validateVoucher(). This method will receive as input from the user, voucher_code and email. Once we receive these details, we will check our database to ensure that the email address exists. If the email address exists, we will proceed to check if the voucher code belongs to the user. If that passes validation, then we will get the percentage discount on the offer, mark the voucher as used and store the date of usage. If our validation fails, we will send an error message as output to the user. We used a findEmail() which receives $email as an argument and connects to the user model. The method goes to the database to check if the user exists. If the user exist, it will return the user’s details back to the controller. We also have a method called validateVoucher() that receives two parameters, voucher_code and user_id. The goes into the voucher model and checks that the voucher exist, and it also checks to ensure that the voucher belongs to the user requesting for it. Finally, we called activateVoucher() method which activates the voucher, sets the status as used and stores the date in which it was used. With this, we are done creating our second endpoint 💃🏼. 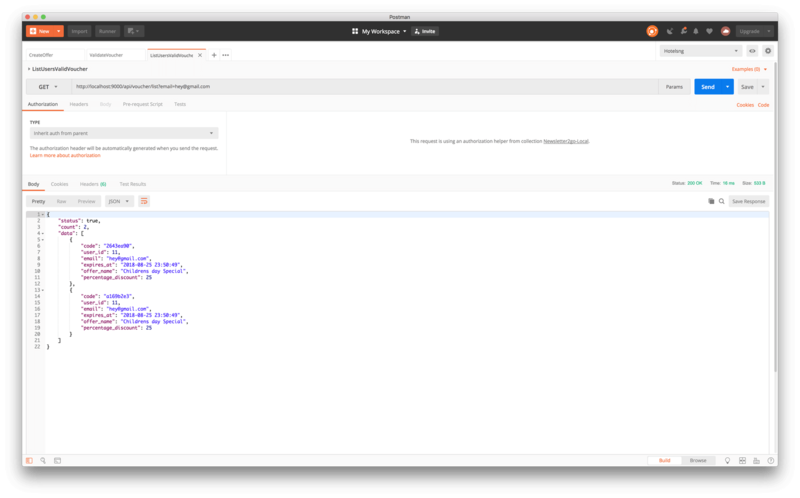 Using Postman, make a POST request to http://localhost:9000/api/voucher/validate endpoint. To achieve this, we will create a new method in our VoucherController called fetchAllValidVoucherPerUser(). This method will receive as email as input from the user. Once we have the users email, we will check our database to ensure that the email address exists. If the email address exists, we will proceed to retrieve all the valid voucher codes of the user. Voucher code is yet to be used. Once we have the user’s email address as input, we check to ensure that the user exist using the findEmail() method. If the user does not exists, we will return an error back to the user. If the user exists, using the fetchSingleUserVoucher() that connects tot he voucher model, we will fetch all the valid user voucher codes. And that is it, we have created all the endpoints needed for our voucher pool API. Using Postman, make a GET request to this endpoint http://localhost:9000/api/voucher/list?email=hey@gmail.com endpoint. In this tutorial, we have looked at how to build a voucher pool API using the Slim 3 PHP framework. We set up a controller for voucher manipulation and creation. We also defined methods to fetch and create valid voucher codes. 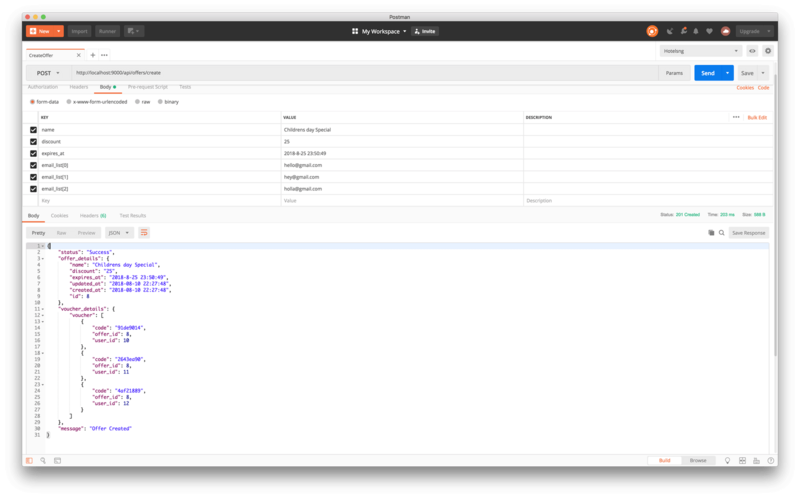 We saw how to test our output data using Postman.